Miami certainly has a need on the OL still. That said, tis is the season for misinformation. Fleming was in the 3rd round range all along and then ascended into the 2nd round. I think TE is a "buzz" position right now in the NFL and because of it TE's are being over drafted, I don't see the next J Graham in Ebron, but Ebron will be over drafted, we already have a pass catching TE and another in development with Eggy, imo Ebron is closer to Clay than he is to J Graham, but every body is going to chase the white whale at TE right so he'll be over drafted when in truth what we do need is someone who can block at the position, Hopefully Sims comes along this year but I would personally pass on Ebron, I don't see a superstar TE in him, it's no slam dunk anyway, I would stay away as we have more pressing needs and he isn't in the elite NFL TE mould imo. Finster the problem with this draft class is that there is no depth at the tight end position, so naturally Ebron's value and Amaro and Niklas and Sefarians values are all driven up. After those 4 it is very weak. I've been waiting for breakout candidates to surface from small schools and such but they haven't. So if you need a tight end this year grab one early. I wouldn't mind trading back and using our top pick on Amaro. Mark, if he was originally there when I did the mock, I would have considered him at that point. I agree 100%, and that's why I stay away from TE especially this year, just like I would have stayed away from DE last year at the top, it was a weak class. I'm also all for trading down in this draft, if I could I would trade down twice right out of the first round and pick up 2 or 3 extra picks in the 2nd-5th rounds in this very deep draft and add as many bodies as I could building this team for the future. I've read from multiple outlets the past 6 weeks that this is the guy everyone is sleeping on Tony. Scouts have mentioned Stanford T Cameron Fleming as the offensive linemen "people" are sleeping on, according to draft insider Tony Pauline. I don't agree with Ebron being a top 10 overall prospect, yet I have no problem with Miami taking him at 19. Ebron works the whole field well, makes alot of key catches. Could be an Antonio Gates type. I see that he Cameron is now rated as a 4th round pick by NFL Draft Prospects, the CBSSports.com site. I do like him as a player. Smart, tough, physical. I would have no problem with taking him in the 4th round. In regards to taking a TE, I just not sure Miami will look to take one. A big WR, possibly, but I just don't see Miami taking a TE. unless Sims is a legit NFL caliber tight end, I think we still need one. Clay is an h-back. If this is the truth, and Lewan is our guy, I hope we pull the trigger and trade up to get him. It only took a 2nd round pick for us to go from 12th to 3rd overall last year. If Miami can give up a 3rd to get into the top ten and land Lewan, I'm all for it. I think that would be an excellent move. Lewan would be our starting right tackle for the next four years. When Albert's contract is up, Lewan would slide over to the left side and we'd draft another right tackle. It's as simple as that. Seeing as how this draft is so deep I seriously doubt we can get that type deal again, last year was a weak draft which is why we moved up so cheaply. I mentioned Bryant for us a while back. Would be happy to add him. The Dolphins invited Clemson WR Martavis Bryant to visit team headquarters for a pre-draft visit. No word yet on if the invitation has been accepted or when the meeting would take place. Bryant is a strict vertical weapon with imposing measurements at 6-foot-5 and 200 pounds with forty times in the mid 4.3s. He's been compared to Justin Hunter and the late Chris Henry. Trading up to get Lewan isn't simply a move to get a RT. It's a move to give us bookend tackles to protect Tannehill for the next four years. In addition, you're drafting your left tackle of the future. 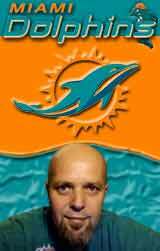 If I'm not mistaken, the Dolphins left an out at the end of Albert's contract. They can let Lewan start at RT for the next three or four years, and then when Albert's contract is up or he is cut, the Dolphins can slide Lewan over and make him the LT. In Lewan you're getting much more than a RT. You're getting a player that can play either tackle position at a very high level. Remember, in the NFL you're always one play away. Albert goes down, Lewan is a safety net to ensure Tannehill doesn't get blasted like he did last year. I'd rather sit tight and take Martin or Moses than trade up again for an inconsistent Lewan. I'm seeing more people say that if you watch Lewan's games he's not that impressive in run blocking.